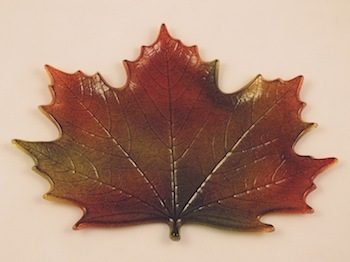 The Northwoods Maple Leaf mold creates huge, classic-looking maple leaves measuring 9.5" (24cm) across and 7.5" (19cm) tall. 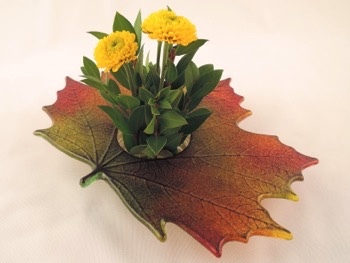 Fill it with oranges, reds, tangerines, and yellows to create autumn leaves or use greens to create the new leaves of spring. 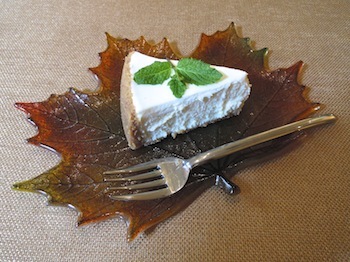 Flip the mold over to discover the custom slumping surface that shapes the cast leaves into plates perfect for a salad or slice of cheesecake. 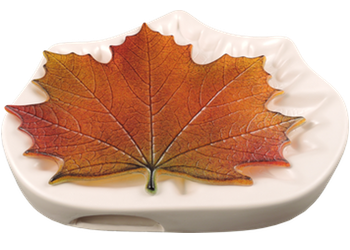 Or, if you prefer, tack fuse three or more of them together to create amazing platters and wall art. The mold itself measure about 11" by 9" (28 by 23 cm). The fill weight is 300 to 320 grams. 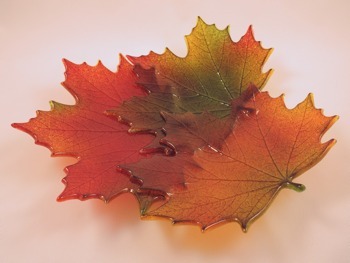 Click on the green Learn tab to find project sheets and videos.